After blowing a few supersonic ones while trying to mounting them, these work pretty good. 87g on my scales for a 6mm length valve. I have saved a few grams with these, it all counts! Light and durable. Highly recommended! Great spare tube. Heavier than the supersonic but a bit more durable. These are great inner tubes. Light without being flimsy and at a good price point on Merlin! Good quality tubes, only ones I know that have the removable valve, used them before with no issues. Correct size and serves purpose. However, metal shaft does not come with entire spiral screw threading and screw. Hence shaft may wobble on the move. Solution is to use a bit of electrical tape around shaft to secure position in contact with the rim. Lighter than the usual tube, require more frequent pressure checks. Very light. Quite fragile. Do not use as a spare tube. This is a lightweight tube that has a small volume when rolled up and fits in easily to small saddle bag. Ive only used one so far but found it worked as well as anything else on the market and at a lower weight and size. I have just bought the even lighter Supersonic tube to try but haven't had a chance yet. I am careful putting on tubes and mostly have been using Specialized Turbo lightweight tubes but these are more expensive and a bit bigger to carry in a pocket or saddlebag. If you fit a tube with a small amount of air in it without twisting it or pinching it and put in well into the rim and take your time (as you should with all tubes) then you have a perfect fit. All lightweight tubes will need their air pressure checked a little more than thick, heavy tubes but they don't lose air anywhere near as much as Latex tubes. I could definitely notice a difference between the light and regular. These are really easy to damage, but worth it. Continental inner tube is one of the best inner tube in the market. This is the only tube I trust. Excellent product and excellent service from Merlin. I'll be back for more! I bought these to replace my stock inner tubes which were large tubes designed for 25-32c tyres and they were 125g each. These light tubes came exactly 80g as claimed, so I saved 45g of rotational weight from each wheel. It was easily noticeable in the first ride (could be the lowered rolling resistance also). It has been about 700km now and never experienced a puncture. I used them with 25c GP4000S II tyres and inflate them to 110/120 psi. Our roads are far from smooth either. So far so good! Lighter with no higher risk of flats. Worth little more investment. A good, high-quality, lightweight tube. Used Continental tubes now for a while, no problems highly recommend. Great value. 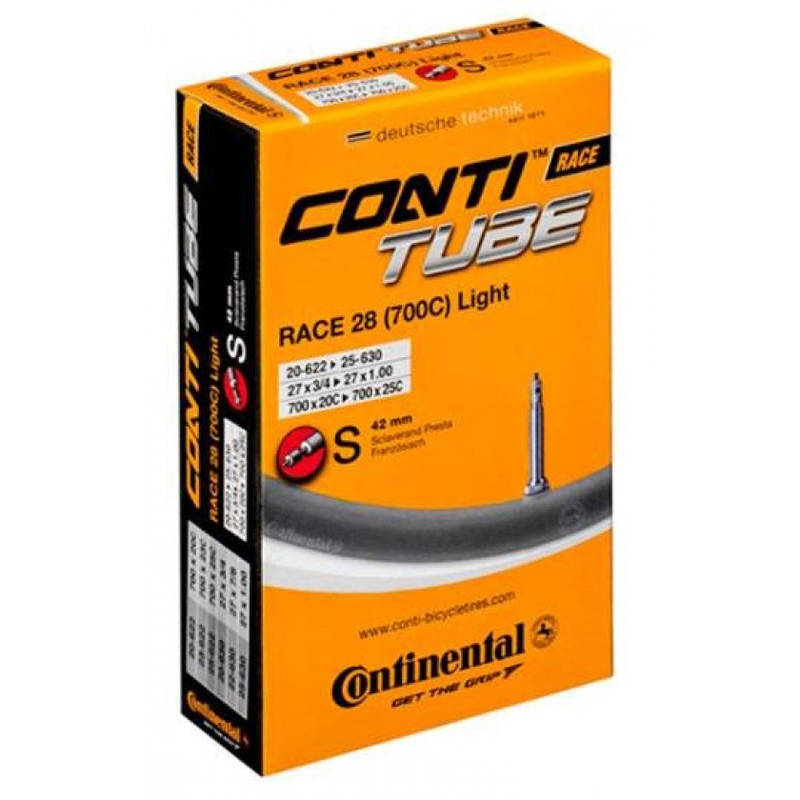 Conti tubes have always been my choice for a quality product that you can rely on. Solid tubes, the extra money seems worth the weight savings. Been using these for a while with no more or less flats than with standard tubes. You do save about 1oz./wheel. Super light, makes it easy to carry a couple with no issues on longer rides. No punctures as yet. Very light tubes. Will make a huge difference in performance. Bought to go into GP 4 seasons. Light and durable. My favorite tube... light and Conti... nothing else to say. A very good tube in my opinion, a good compromise, light enough to notice a difference but not too thin and decent puncture resistance. Merlin as always fantastic service and delivery, now my favoured site to order through for cycle bits if possible. Very light and occupies little space in my spares kit. Holds pressure well. Light and leak-free. Pack down nice and small. What more could you need?! Wanted to reduce my bike's overall weight, which meant new wheels and tyres and thought I'd go the whole hog with new inners. Only used once, on a 70 mile jaunt on potholed London and Essex roads. No problems and didn't lose much (if any) air pressure. I purchased a relatively narrow wheel with a 42mm carbon rim and soon realised it wasn't easy to get a quality tube, presta with a 60mm valve to fit. The Conti tube has ticked each of these boxes and has ridden really well. Noticeably lighter than the standard Race. Don't lose air too badly either. Haven't had a puncture since putting them in. Like fact that same weight as a narrower tube, but suit my 25mm Contis. Really pleased with these, so much lighter and thinner than the standard conti tubes. Over 300 miles so far with my new Gatorskins also from Merlin and no p f visits yet, and great service from Merlin as always. Can definitely feel that this tube is lighter than regular tubes. Nice light tubes, don't lose pressure too quickly at high pressures like some tubes can. What can you say about inner tubes. They either work or they don't. The only additional thing I can say about these inner tubes is that the extra long vale means that you don't have to use valve extenders when using deep rimed wheels. Much lighter and better tubes than the ones I used before. I will definitely use these in the future. Great service by Merlin as usual. I've just bought a beaut set of light wheels for racing so why put anything but light tubes on them. As part of a lightweight combo its a no brainer. Great lightweight tubes, no puncture issues and a good weight saving over standard version. Great combination with the Continental GP4000s tyres. Great tube, I always use them. Great inner tubes. My preferred choice. Good light tube, shorter 42mm stem length fine with non aero wheels, another good buy, will be ordering some spares too. As described. Best price on the web. Always good to have a spare tube you just never know if you or a mate is going to get a flat.